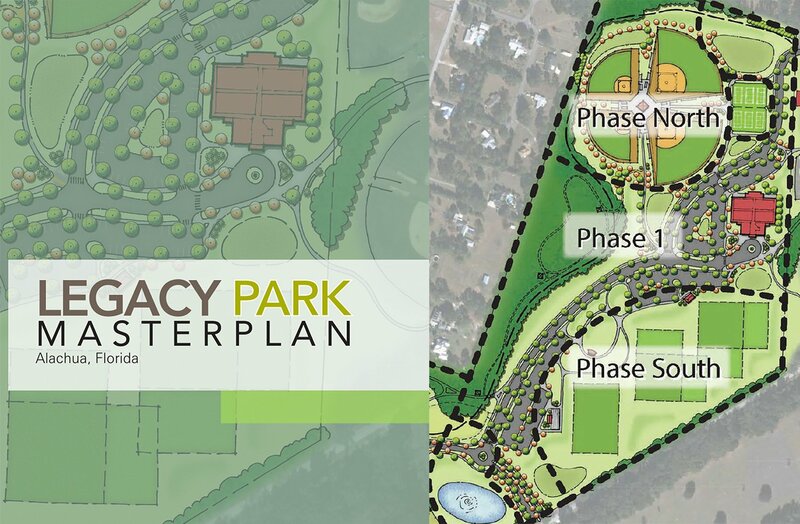 In 2010, the City of Alachua was presented with an opportunity that would allow expansion of their recreational and cultural opportunities through the purchase of a 105-acre site contiguous with the City’s premier community park, the Hal Brady Recreation Complex. The City reached out to CHW and asked for assistance with the conceptual development of a Master Plan for a new City Park coined Legacy Park. This early Master Plan was to be used by the City to build community support and raise funds to purchase the land. In 2012, after the City was able to realize their dream of purchasing the land, they again reached out to CHW for assistance in refining the Master Plan and to develop a phasing plan for implementing the improvements. This refined plan provided a resource to guide future development and the detailed design as various projects phases are initiated. It also provides the City with a roadmap as the park evolves and solidifies its place as a cornerstone of the community. CHW was responsible for development of the conceptual urban design of the Master Plan, the preparation of presentation graphics to build community support and fund raising, as well as civil engineering and landscape architecture documents for Phase 1 of the project.